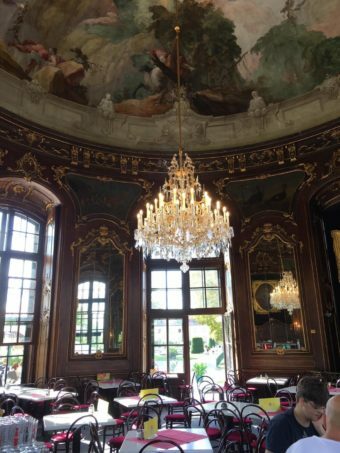 …and for eating, the Café Centrale and the Ilona Stüberl, a Hungarian restaurant started by immigrants in 1957 to help refugees from their home country. Our meals there were delicious. This is a huge zoo with over 700 species. It’s also the oldest zoo in the world, founded by the emperor Franz Stephan, husband of Maria Theresia, in 1752. It started off as a menagerie for the emperor to enjoy: an octagonal pavilion for imperial breakfasts at the centre of a circle of animal enclosures. And the animals’ given names were fun too – the anteater’s name was Ilse. I can imagine having an Auntie called Ilse. As you’d expect in a zoo this size, there are big cats, giraffes, orangutans and loads of other fascinating residents as well as the animals listed above. The zoo places great emphasis on its role in conservation. 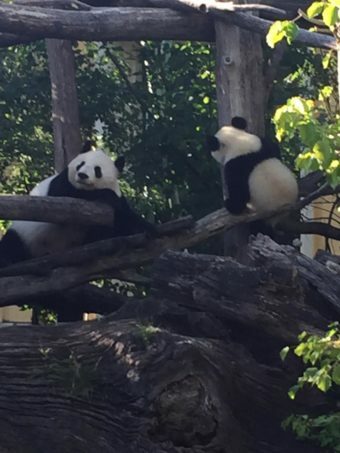 My absolute favourites were the twin pandas Fu Feng and Fu Ban, born in the zoo in August 2016. Amazing to think that panda babies weigh only 100g at birth and the twins now look so robust, at one year old. For kids there’s the Streichelzoo, or petting zoo, and play equipment distributed throughout the zoo. A good idea for kids to let off steam as they go along! The original imperial pavilion is now a lovely café in the centre of the zoo. For a zoo café it has a very ornate interior. The zoo is open 365 days a year, from 9 am to somewhere between 16.30 and 18.30 depending on daylight hours. There’s a range of ticket prices, typically 20 euros for an adult and 10 euros for a child over 6 years old. Children under 6 go free. The zoo was clean and well-kept, not too crowded, so we got to observe lots of animals without having to struggle through a crowd just to catch a glimpse. There’s even a place where you can give up that heavy rucksack! 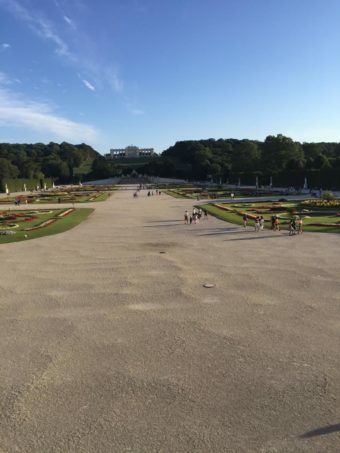 We set aside the following day for the Schönbrunn Gardens and Palace. It turned out that this was not nearly enough time to see everything we were interested in. We could have spent a week visiting this site. As well as our time restrictions, there’s always a limit to the information and experiences we can absorb in a short time and still enjoy them. 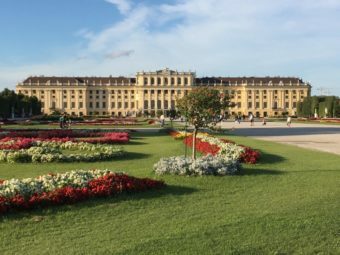 The name “Schönbrunn” comes from “schöner Brunnen” – beautiful spring, after the spring which was found here when the gardens were first laid. Open to the public free of charge, the magnificent gardens cover an area of about a square kilometer. They were laid in the 18th century as a sort of extension to the rooms and contents of the palace, to expand the symbol of imperial power. The style of the garden is formal and symmetrical, with lots of trees. This is where, in a wooded area, we spotted a red squirrel! In the UK we’re so overrun with the grey ones that we couldn’t stop looking at it. 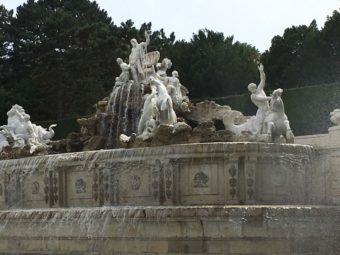 The impressive Neptune Fountain was sculptured in 1780 by Franz Anton Zauner, under the emperor Franz Stephan. 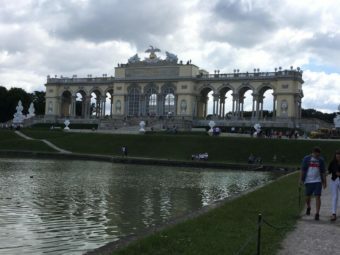 At the top of the hill is the Gloriette, a massive folly. 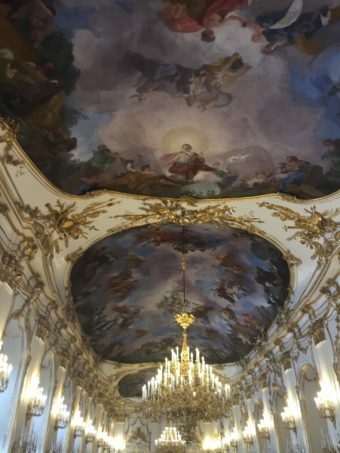 It’s in neo-classical style, designed by Ferdinand von Hohenberg and built in 1775. It’s elegant and beautiful, and its exterior is there for everyone to admire free of charge. 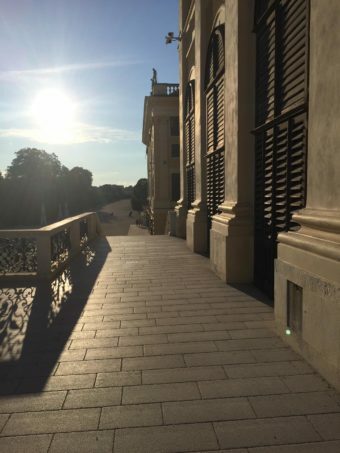 There’s a charge of a few euros extra to enter each of these garden features: the Gloriette, the Palm House (vast collection of exotic plants, built 1882), the Privy Garden, the Orangery Garden and the Maze. You’d need plenty of time to visit all of these. This marionette puppet theatre in the Schoenbrunn gardens was founded in the 18th century. The opera Die Zauberflöte (The Magic Flute) and other shows are performed there regularly but unfortunately there were no showings at a suitable time for us. In the UK, puppet shows are generally aimed at small children, so this would have been an experience we couldn’t have had at home. A puppet opera of 90 minutes would be rather long for most young children, so there are special children’s showings to cater for them. Apparently the auditiorium is very small, so you’d get a good view from any one of the seats. 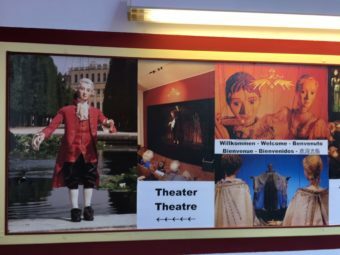 Even if you don’t get to watch a performance, you can watch videos free of charge in the adjoining café, and learn how the wooden marionettes are crafted and operated. 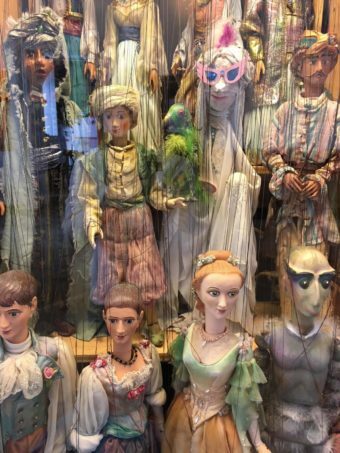 You can view some of the marionettes from previous productions, about 60 cm tall, in a glass case. They look completely lifeless of course. But we could still imagine them as part of a dramatic story. The specialist training needed to bring them to life on stage, ie. become a puppeteer, takes several months of intensive work. In an adjoining room we could see some of the staff maintaining the puppets being used in the current production. You need to be aware that the operas are in German, so if you don’t know the language it would be worth getting to know the basic story beforehand, perhaps by consulting YouTube. The marionette theatre website is at www.marionettentheater.at and tickets cost 8.80 euros. We didn’t have time for this, but it looked interesting. It contains the coaches, sleighs and sedan chairs used to transport the imperial family. This public pool looked lovely – and nearly empty – when we looked in, but we didn’t have our things! It would have been good to have a refreshing swim after spending a few hours sightseeing. We were disappointed not to have time for this. It shows what life was like for the children in the imperial family. From one of the palace windows we looked down on some children playing in an outside area of the museum with replicas of the toys and clothes to dress up in. It looked like a lot of fun. Entrance costs 8.80 euros for adults, and 6.70 euros for children and young people under 18. This was the summer residence of the Habsburgs, and it was theirs from 1569 until the end of the monarchy in 1918. 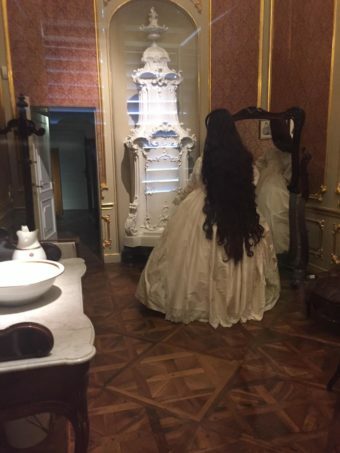 They spent the winters in the Hofburg Palace in central Vienna. We’d already visited the private and official chambers there. 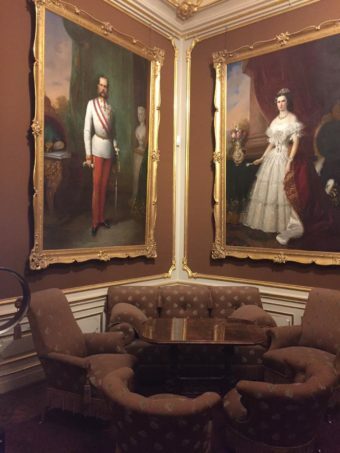 My favourites were the dining room and the dressing/exercise room of the Empress Elisabeth of Austria (Sisi), wife of Franz Joseph. You even get to see the exercise rings she had fitted into the door frame there, to keep herself strong. 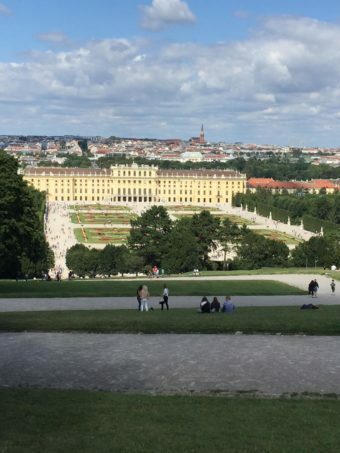 The Schönbrunn Palace is even more imposing than the Hofburg, and not just because of its setting. It’s known to be one of Europe’s most beautiful Baroque complexes. It was redesigned under Maria Theresia in the 18th century. 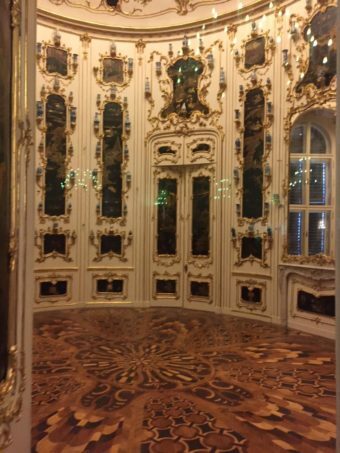 In total there are 1,441 Rococo-style rooms in the palace, of which 45 can be visited. Emperor Franz Joseph was born here in 1830, and he, his wife Elisabeth (Sisi) and their children were the last occupants. 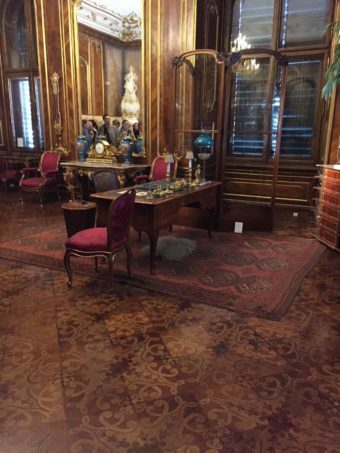 You can view the Blue Chinese Salon where Karl I abdicated in 1918, marking the end of the empire. 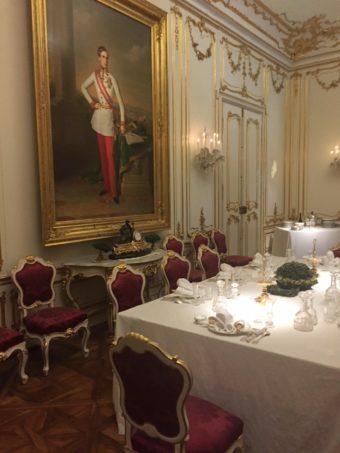 We paid around 14 euros each for the Imperial Tour, which includes 40 state rooms and private appartments occupied by Franz Joseph and Elisabeth. 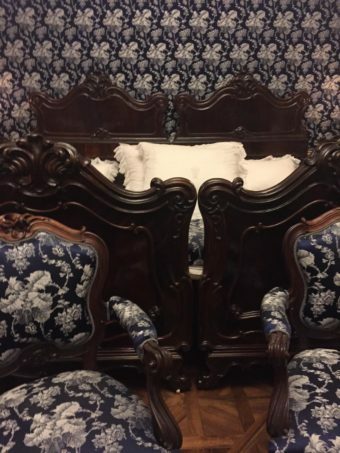 You’ll see 19th century furniture, beautiful paintings, gilded paneling and wall paper with hand-painted floral designs. You’re not allowed to take photos inside the palace, but in the peak tourist season this must be difficult for the staff to enforce. I’m including some photos, but I must emphasize that I did not take them. It wasn’t me. 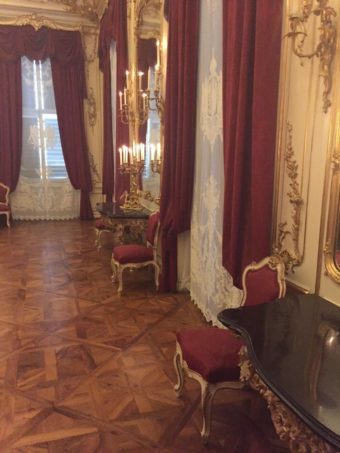 A Grand Tour costs around 17 euros, and this includes the rooms used by Maria Theresia. 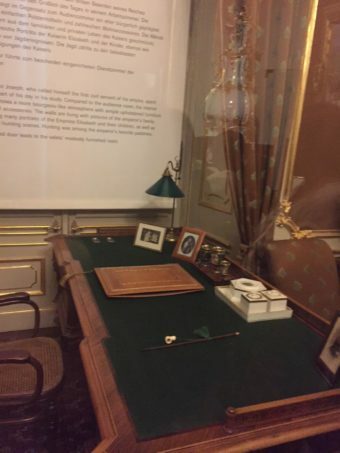 If you’d like to know more about “Sisi”, you can visit the Sisi Museum, which displays some of her possessions. The museum shows something of her personality: the poetry she wrote, her interest (or maybe obsession) in keeping slim and fit and her aversion to courtly ceremonial. As we had to miss this out, I’d be interested in reading one of the biographies which have been written about her. In case you still have some energy left, daily concerts are held in the palace at 20.30.